My amazing journey “-60 to -110”. So you are now holding different records in few disciplines. Can you please explain us the differences on being successful in the pool or in the sea? “After my short experience in both disciplines, one of the biggest differences I consider is the pressure of the water that is increasing as we go deeper into the sea. With increasing depth, we not only have to become masters of equalization, but also good controllers of our own mind. It is a very important skill to be developed. During my training for the -103 NL record, I was several times in the situation where clear analytical assessment of my own mental condition was the only way forward, and finding out my subconscious phobias and fears, helped me to avoid any delay in progress of training. Furthermore, influence of nitrogen narcosis is another critical obstacle that demands special care and is unique to deep diving. I believe that abilities like full understanding of your body in every moment of the dive, technical attitude and countless repetition of systematic movements, are the key to become a successful deep-sea diver. Despite your short experience on free diving, you have easily reached nice and important numbers on depth. How does it work exactly? “For such a rapid move I give a credit to my current coach Marco, who slowly but surely guided me through this jungle of knowledge and experience. Nevertheless, my passion for Yoga also had a great influence on the rapidity of our progress: it helped me to reach and maintain a good physical and mental condition. I have spent hours of focused practice to bring more flexibility to my own body and mind. Flexible body and open mind are surely the keys for immediate application of suggestions that was given to me by my cool coach, and are the biggest reason of this fast descent. During my training with Only One Apnea Center I have learned that the most important part of this game is to believe in what you do, do it consistently, and do it with a lot of attention to details and concentration. While building all my skills that are required for reaching the goal of -103 meters, we had very little stress. All the deep dives were only confirmation of what we already knew and no matter how stressful I used to be before the new steps in conquering the depth, Marco’s attention to details and experience in this sport would put me back in shape ready to rumble. As well I want to put everyone’s attention that I have started training deep diving techniques long before doing any deep dive. Minimum of 1 hour per day of total concentration in performing dry exercises of specific-advanced equalization and breathing techniques was a central aspect of focus for the first 3 months of my training. Deep-water dives were only “the test ground” for all the hard work I did on the land, and took place only in the last stage of the training, due to scientific approach of Only One Apnea Center, trained mostly in “shallow” water. We imitated the difficulties of very deep dives and have built the skills required. This approach allowed us to increase the amount of repetitive dives that have noticeably boosted my confidence at depth. The only skill that we had to develop by direct exposure was the tolerance to nitrogen narcosis. Slow, steady progression and all the considerations mentioned above, helped us to move forward in a very safe way. The suggestion when choosing dry training is very simple “the easier, the better” I think it creates a bigger chance that you will keep doing it. Other important part is: how you do it? 5 minutes of extra focus is more valuable than hours of “focus-less” effort. Understanding what we do, increase the chance to do it right in any possible circumstances. Why the decision to go for a No Limits record and why to do it head down, position that clearly doesn’t help the performance. So you are still learning advance equalization technique. What’s for? 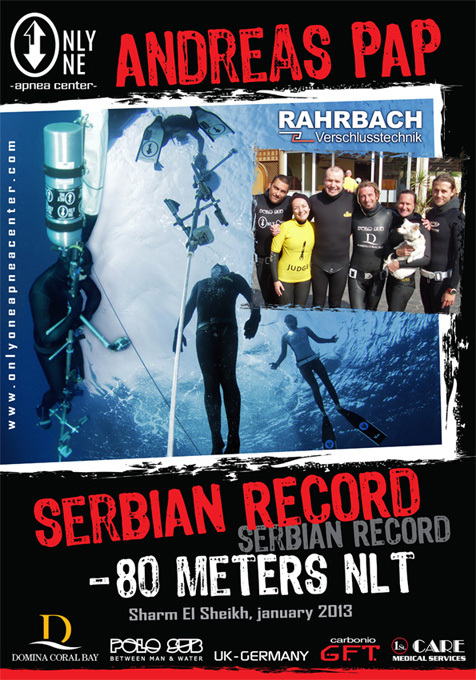 Another national record has been set at Only One Apnea Center: Andreas Pap from Serbia has just resurfaced from an amazing dive to 80 meters in the technical discipline of No-Limits. Andreas’s adventure started two weeks before, once arrived at Only One Apnea Center, in the new location of Domina Coral Bay: despite the Christmas time, he has decided to spend his holidays training free diving, in order to add a new record to his experience rather than enjoying a typical Christmas tree… very good decision!!!! Since the beginning of the preparation, during the firsts dives on the sled, Andreas felt very comfortable with the depth and with the new discipline (for him) of No-Limits diving and thanks to his high experience in others disciplines he has reached very quickly the right feeling with the water. 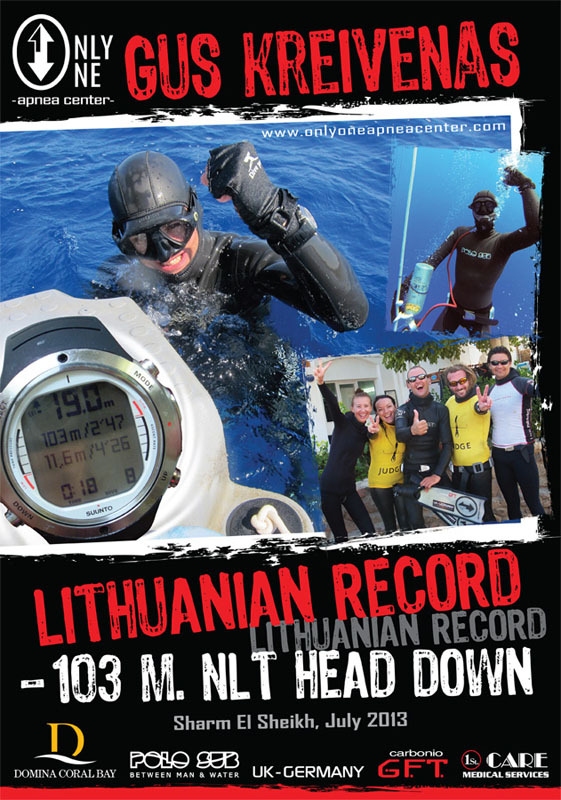 In the previous days he dived with the sled multiple time per day, in order to reach the record’s depth, with easy progressions, some days before the attempt, to have the highest chances possible to successfully perform the dive during the official record attempt. Infact, in free diving, the stress created by “the official attempt” and by all the attentions around the athlete, may influence negatively the performances, that’s why repetitive dives at target depth makes easier and easier for the athlete perform the dive in any conditions. The official day started in the best way: sunshine and flat sea conditions… who wants more? During his warm-up Andreas felt very well, without any tensions or signs of stress; infact, after 3 easy dives, he decided he was ready to jump on the sled for the first dive of the day, at 40 meters. Resurfaced without problems, he immediately started to get ready for the second “deep dive” before the target dive: 45 seconds of descent to reach the bottom at 60 meters and still everything were fine… everyone start feeling “positive vibrations” about the target dive! At 11.00am everything is ready for the attempt: doctors from “First Care Medical Services” are on the platform, AIDA judges are ready to look at any details, organizer and safeties are fully focused on their job and videocameras are running… 30 seconds… 20 seconds… 10 seconds… 5,4,3,2,1… (few seconds delay, maybe stress?) …GO! The sled disappears from the surface, the dive has began!!! After 30 seconds Andreas should be at 40m: no signs of brak… 45 sec/60m and still going…. 50 sec/70m and still going… 55 seconds and… TOUCH DOWN at 80 meters! Just half way to the record! Now: inflate the balloon, change the position, keep relax and enjoy the ascent. After 1 minute 55 seconds from the beginning of the dive, Andreas resurface with a big smile on his face and perform the official surface protocol to judges and cameras it’s a pure formality, insuring the validity of this spectacular record dive and the new Serbian National Record. Well done man!!! Only One Apnea Center really likes to thanks his sponsor for all the support received: Domina Coral Bay, Uk-Germany, Polosub, Carbonio GFT and First Care Medical Services. A special thanks to Linda Paganelli, Jacques des Vos, Paola Moccia and Luca Novelli for their precious help. Un altro Record Nazionale è stato realizzato ad Only One Apnea Center: Andres Pap, atleta Serbo, è appena riemerso da una fantastica immersione a 80 metri nella disciplina tecnica del No-Limits. L’avventura di Andreas è iniziata due settimane fa, quando è arrivato ad Only One Apnea Center. Nonostante il periodo festivo, invece di rilassarsi con una classica vacanza natalizia, ha deciso di allenarsi due settimane per realizzare il suo sogno: stabilire un nuovo record nazionale… ottima scelta! Fin dall’inizio della sua preparazione, Andreas si è subito sentito a proprio agio con la profondità e, grazie alla sua grande esperienza da apneista, ha raggiunto molto velocemente il giusto feeling con la slitta, nonostante la disciplina del No-Limits per lui fosse una novità. Per aumentare le possibilità di performare con successo l’immersione del record, nell’ultima settimana Andreas si è immerso con la slitta più volte al giorno, raggiungendo la profondità target svariate volte, attraverso facili progressioni. Nell’apnea, infatti, lo stress causato dal tentativo di record ufficiale e tutte le attenzioni rivolte all’atleta, possono influenzare in maniera negativa la performance; ecco perchè arrivare ripetutamente alla profondità target durante gli allenamenti, rende molto più facile, per l’atleta, poter ripetere l’immersione in qualsiasi condizione. La giornata del record è iniziata nel migliore dei modi: il sole splende, il mare è piatto… cosa si puo’ chiedere di più? Durante il riscaldamento Andreas si è sentito molto bene, senza alcuna tensione o segni di stress; infatti, dopo 3 facili tuffi, si è subito sentito pronto a salire sulla slitta per la prima immersione della giornata, a 40 metri, per avvicinarsi all’obbiettivo. Riemerso senza alcun problema, ha immediatamente iniziato la preparazione per la seconda ed ultima immersione profonda prima del tentativo ufficiale: 45 secondi di discesa per raggiungere i 60 metri senza il minimo problema… tutti quanti hanno iniziato ad avere vibrazioni positive riguardo il record! Alle 11.00 è tutto pronto per il tentativo: i dottori del “First Care Medical Services” sono in piattaforma, i giudici AIDA sono pronti a controllare ogni dettaglio, gli organizzaori e gli apneisti di sicurezza sono concentarti sul loro lavoro e le videocamere stanno riprendendo. Parte il conto alla rovescia: 30 secondi… 20 secondi… 10 secondi… 5,4,3,2,1… (qualche second di ritardo, forse stress?) …..GO! La slitta scompare dalla superficie, l’immersione è iniziata!!! Dopo 30 secondi Andreas dovrebbe essere a 40m: nessun segno di frenata… a 45 secondi/60m sta ancora scendendo… 50 secondi/70m e ancora scende… 55 secondi e….. TOUCH DOWN a 80 metri! Perfetto, ma è solo a metà strada per il record. Ora bisogna gonfiare il pallone di sollevamento, cambiare la posizione, mantenere il rilassamento e godersi la risalita. Dopo 1 minuto e 45 secondi dall’inizio dell’immersione, la faccia di Andreas riemerge dal blu con un gran sorriso e la realizzazione del protocollo di superficie, di fronte a giudici e videocamera, risulta essere una pura formalità, comunque necessaria per assicurare la validità del nuovo Record Nazionale Serbo: bravo Andreas!!! Only One Apnea Center vuole ringraziare i suoi sponsor per tutto il supporto ricevuto: Domina Coral Bay, Uk-Germany, Polosub, Carbonio GFT e First Care Medical Services. Un ringraziamento speciale va a Linda Paganelli, Jacques des Vos, Paola Moccia e Luca Novelli per il loro prezioso aiuto.